Share the post "Spring Security Remember Me Example"
There are two methods in Spring Security for Remember Me service. One is using cookie in browser and the other one is using persistent. In this Spring Security Remember Me example, we will be using the persistent method which is more secured. remember-me-parameter – this is the parameter name of your input tag in your html. Basically you will use an input type checkbox here. Lastly, add the remember me input tag in your login html. Take note the attribute name is the one that we defined in our spring security context. 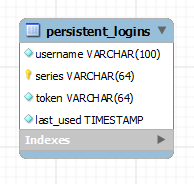 Then test it and if you have checked this input and logged in, it should add data to your persistent_table and save cookie to your browser.